On Sunday 28th February, I had an overriding desire to show Sathya Sai Baba a print of The Rainbow Crucifixion, the painting that I had completed at Chaitanya Jyoti some days before. I was exploring the possibility of having a print made of the painting for this purpose, and I decided to go to the photographic shop outside in the village to do this. It was a busy morning outside the ashram of Sathya Sai Baba, in Puttaparthi, India. Passing the usual flower sellers with their colourful displays of flower baskets, I could see the owner of the photographic shop. I had arrived just at the moment he was just leaving. I asked whether it would be possible to have a print made for Swami’s darshan that very day. He agreed that it was possible, and the young man behind the counter inside the shop also assured me that the print would be ready at 5 o'clock. Returning at 5 o'clock, I was dismayed to find that the print was not available. The explanation that the printer had broken down was given with lowered eyes! I felt a feeling of negativity, almost as though there was a dark force at work. That Swami would not be able to bless the painting that day seemed somehow inconceivable to me. My sixth sense told me I must get the painting image to Swami at darshan that evening. I went back to the room puzzled about the situation. What to do? When my wife and I arrived back at our room, I remembered my broadband provider, a young man in the town, and emailed him, asking if he could provide a print this evening in time for darshan of the Lord? I had a prompt response from him: Yes! I immediately emailed him the jpeg file. Time was now imperative. Then he emailed back saying, sorry, the image was not high enough quality. Another image was sent, and that one was OK. I could come around as soon as I liked to collect it from the shop. Leaving the room almost immediately, I made my way to the shop through the busy streets and alleyways, and went immediately back into the ashram with the print. I entered the Mandir and took my seat at the back of the veranda, where Sathya Sai Baba gave darshan. He had already entered the hall, and was sitting blessing the vast gathering of devotees. He left that area and came around the back of the veranda where He might wheel past me in the chair. Would He? Yes, He started down the long passage where I sat. The long wait began. Would a devotee sit in the middle of the passageway as so many had done in the past and block His route? If so, He often would just turn and go back. But, no, today there was discipline in the ranks and Swami came along blessing the devotees. I was able to get to my knees and show Him the painting. It would be the last of my paintings I would ever show him. 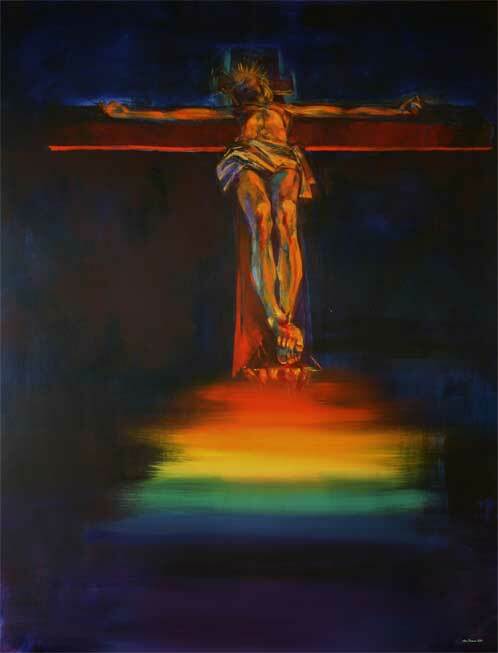 He looked at the image of Christ with the straight rainbow, pursed His lips like a child and said, "Beautiful!" Then the image was back in my hands. I sat stunned by His divine presence, unable to move. He had transported me to another dimension, as so many devotees have felt from His divine Presence. Swami left His body on Easter Sunday, a few weeks later. It is often so with Swami that we only understand His messages to us afterwards. Now, as we sort out His messages to us in those final days, I have come to believe that His blessings of Christ’s sacrifice and death were no coincidence. I believe this was one of His several announcements to the devotees that He, also, would soon be leaving this state of illusion. Look to me and I look to you. other parts of a great army. But Arjuna is quite content to have only the Lord, in the person of Krishna, on his side. The Kauravas get the entire army – but they are defeated. In many paintings of the crucifixion, the viewer is above Christ or on an eye level with him. serving as a witness to the crucifixion. This humble position at the feet of Christ leads to the ideal viewing point, a chance to rise up to divinity. Life is God’s play, a play in which the positive and negative come together. and the positive act of negating this ego and realising divinity. as a rainbow. Christ’s feet are on the red, representing the material world of flesh and blood. miraculously, many times before, and as it has done once again in Sai Baba. 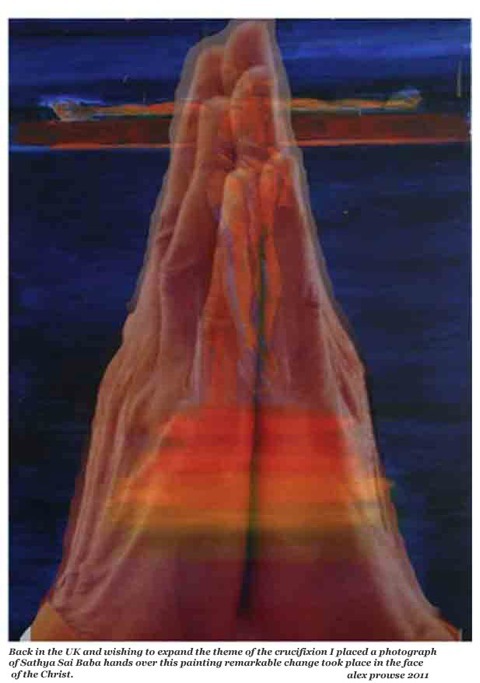 Back in the UK and wishing to expand the theme of the crucifixion I placed a photograph of Sathya Sai Baba hands over this painting remarkable change took place in the face of the Christ. Bhagawan Sri Sathya Sai Baba is no more with us physically, he left his earthly body Easter 04-2011 .